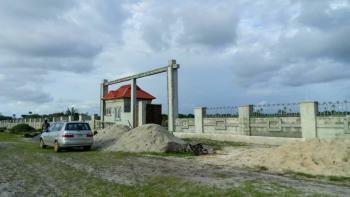 There are 2,857 available flats, houses, land and commercial property in Ibeju Lekki, Lagos, Nigeria. The property have been listed by estate agents who can be contacted using the contact information provided for each property listing. The list can be filtered by price, furnishing and recency. 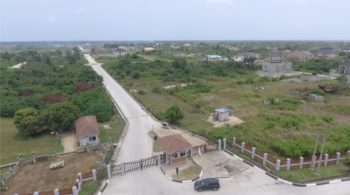 Do you want to buy land in the ibeju lekki axis of Lagos, Nigeria but you are being cautious?In the long run, it's much better to buy a genuine property that is expensive and also have a good title than to buy a cheap property with bad or zero titles at Ibeju Lekki axis.Please be very careful while buying lands at Ibeju Lekki because many of the properties in this axis don’t have good titles.It's a risk to purchase any land in Ibeju Lekki that doesn't have either an excision, gazette or C of O.From our discussions with clients we've worked with, we've come to understand that a lot of investors are keen on tapping into the growing potentials of the Ibeju-Lekki axis but the rampant activities of unscrupulous brokers vending lands with faulty titles or non-excised land has become a major repellent.Because we also believe in being cautious, we have conducted extensive due diligence on all our properties before promoting them.Our major aim is to help our clients acquire choice properties with genuine titles through a stress-free transaction. 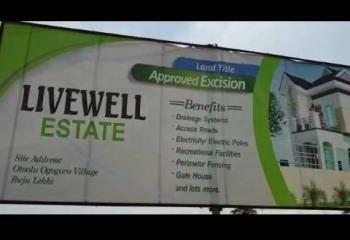 If you're looking to buy land in this axis, Livewell Estate is the way to go. Livewell Estate is 100% genuine and verified by our team of barristers and surveyors. 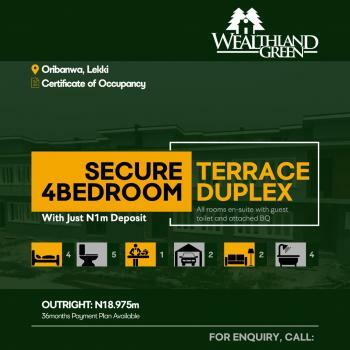 Buy your plot, get allocated immediately and start building...Livewell Estate is well located and positioned directly opposite the new Marine School and other neighbouring development include, the Dangote Refinery, La Campagne Tropicana resort, Free Trade zone, and Deep Sea Port. 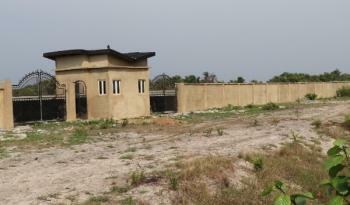 Title; ExcisionContact Monisola Olubunmi Executive Homes and Properties for details: +23480385858122 or 2349087379635. Like us on facebook; Executive Homes and Properties. 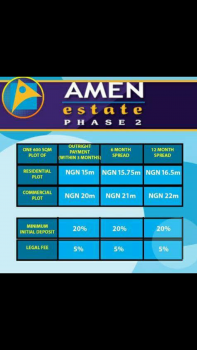 Dear Esteemed InvestorsLAND ACQUISITION MADE EASYIt is a secret dream/fantasy of every average Nigerian to own a landed property which they can offer out for rent or live in.Whether you agree to this or not... 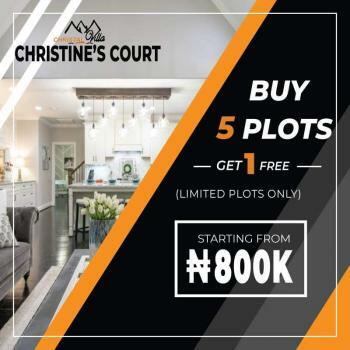 It is a statement or fact.As a dedicated real estate company, we are constantly initiating means to make this dream a reality for the majority of average Nigerians who are deliberate about this dream of theirs.Our luxurious and newly launched Christal Villa-Christine's Court is currently selling at #800,000 per plot, with a buy 5 get 1 free promo offer. 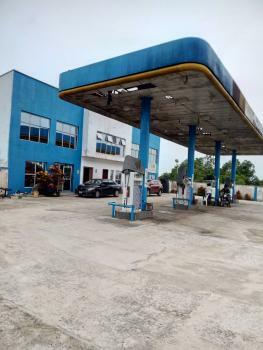 *Location*: Abule Egan, Akodo Ise(Ibeju-Lekki) *Title* Survey*_This is a dream come through and you should take action NOW!! 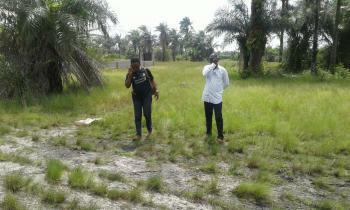 !_*For further enquiries/land inspection, please call 08172710063*CREMP* ... 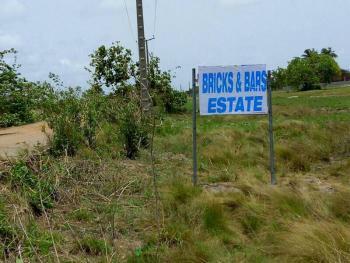 Securing your future through real estates investment. BROOKLYN COURT. Instead of praying fall down and die prayers for your landlord not to remember you when your rent is due , start making plans to sack your landlord and to be a landlord yourself . 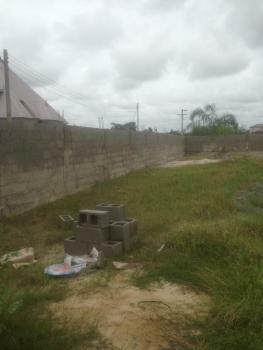 REVOLUTIONPLUS PROPERTY was thinking about you when we acquired this property and we are here to help you ease your smooth transition from a tenant to landlord with this new new estate, BROOKLYN COURT.With neighbourhoods like;DangoteRefinery La Campaigne Tropicana Lekki Deep Sea Port Lekki Free Trade Zone Power Oil LtdTitle: Proposed Excision Call or what's app now 07058923647. 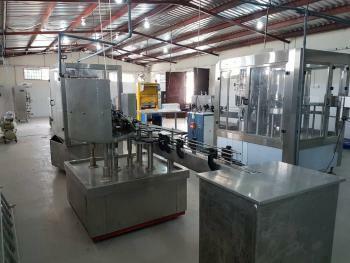 ₦800,000 Global M & A Ltd .
*NEW* *PRODUCT* _______________________________ CHRISTAL VILLA CHRISTINE'S COURTDear Esteemed InvestorsCHRISTINE'S COURT estate is designed for the benefits of our clients that want values for there investment.There is a possibility of 150% increase on investment in this axis within a shortest period of time.This is an amazing opportunity to invest to make life change, invest in your future today.BENEFITS ▪ Beautifully designed layout ▪ Gated Estate ▪ Electricity ▪ Street Light ▪ Visitors Park ▪ Sport Corridor. 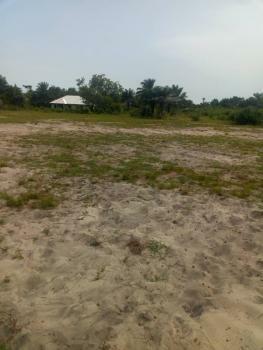 Etc*Location* : Abule Egan, Akodo Ise (Ibeju-Lekki) *Price* : 800k *Size* : 600sqm *Promo* : Buy 5plots get 1 free (Limited plots only) terms and conditions apply *Status* : 100% Dry landFor more information site inspection and plots purchase call/What's app 07063523381 ... 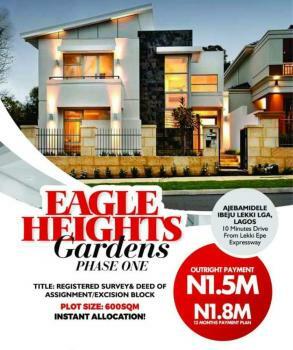 Securing your Future Through Real Estates Investment. 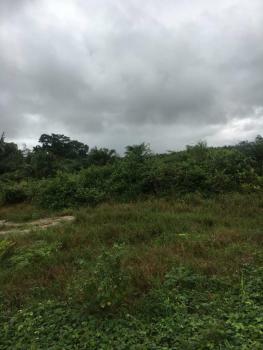 10,000 Acres for Sale at Ibeju Lekki Title: Survey Price: 2.5m per acreThis land is still available and the price will be going up soon because it has really appreciated.WhatsApp or Call 08124791998Documents are available for verification at Land Registry Alausa, Lagos. 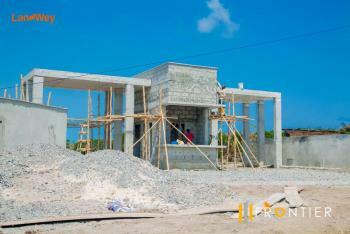 ACHIEVE YOUR DREAMS BY BUYNTRODUCTORY PROMO* Buy 5Plots, Get 1 Plot FREE! 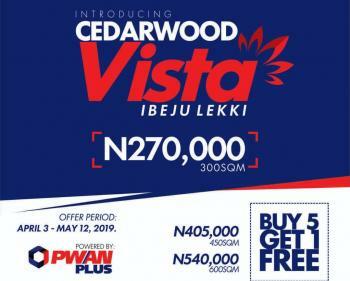 *ZION GARDENS PHASE 2**LOCATION* New coaster road Eleko Ibeju Lekki*PRICE* 600SQM : N 2.5M 450SQM : N 1.850M 300SQM : N1.250M*PROMO* Buy 3 Plots and get 1 Plot Free . CHRISTAL VILLA GARDEN ITAMARUNDear distinguished Investors,SECURE YOUR FUTURE THROUGH REAL ESTATE INVESTMENTOne of the surest way to secure the future in this 21st century is by Investing in Real Estate.I know the word "REAL ESTATE" has been over flogged and it looks like some persons don't understand what it is or probably it has lost it intent and purposes.Real Estate is Landed Property and everything fixed on it. 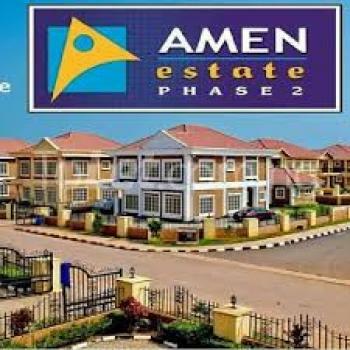 Acquiring a Property can be for personal use, rental or a piece of investment.Owning a Property is not as difficult as it was in our Father's time anymore. It just takes DELIBERATE and CONSISTENT steps.By investing in one of our prestigious Estate, CHRISTAL VILLA GARDEN ITAMARUN. 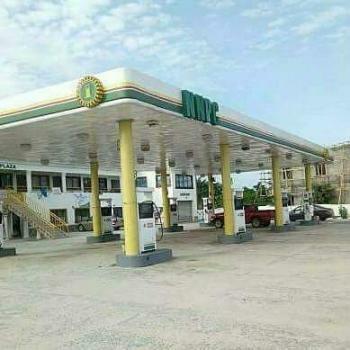 *NEIGHBORHOOD'S* ▪ Dangote Refinary ▪ Free Trade Zone ▪ Power Oil Company ▪ Lacampigne Tropicana resort ▪ Deap Sea Port. 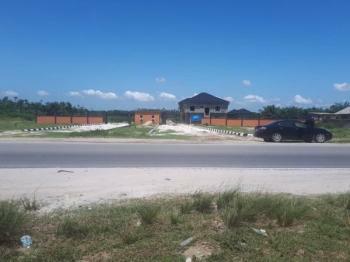 *HIGHLIGHTS* ▪Gate House ▪Good Road Network ▪Electricity ▪Perimeter Fencing ▪ Visitors Park, Etc.Location: Itamarun Ibeju-LekkiPrice: N2.5MTitle: Excision in processSize: 600sqmFor Site inspection/Plots purchase call or Whatsapp 08172710063*CREMP* ... Securing your Future Through Real Estates Investmen.